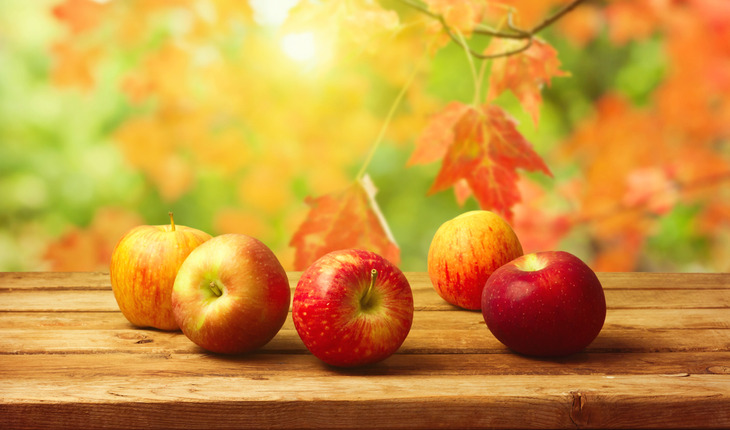 It’s apple picking season – the perfect excuse to head outside for some family fun, or have a romantic day with that special someone and enjoy the crisp fall weather. And what better way to enjoy your delicious handpicked apples than with one of these amazing apple-inspired recipes! Curry gives a fragrant spice to this simple fruit and veggie salad. The peanuts and celery give a satisfying crunch,while the apples provide a sweeter counterpoint – creating a beautifully balanced bouquet of flavors! You love pancakes, but want something healthy? 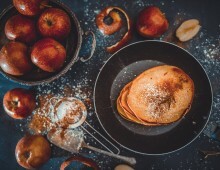 Applesauce pancakes to the rescue! These simple to make, and yummy to eat. Perfect for kids and adult-sized kids alike. Apples, onions, and eggs?! Yes – this winning combination makes a (surprising) delicious breakfast. Try with different types of apples to get different flavors! Honeycrisp apples, true to their name, are both sweet + crunchy. They’re delicious raw, but also perfect for baking. Their sweetness allows us to reduce added sugar, as we did with this apple crisp – so enjoy sans guilt!